Isn't that a great bottle? The stylized elephant is charming, the name "Kenzo" is in tactile raised script in the lower right-hand corner, and there's hardly a straight line to be found, just lush swoops and curves. It's a bottle that wants you hold it, to run your hands over it and explore it. 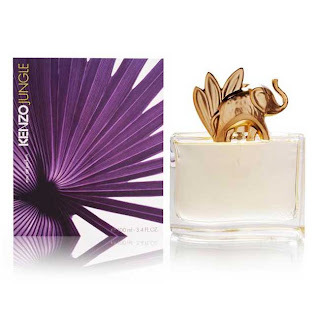 I wish I could be as enthusiastic about the contents, which you would think would be right up my alley: Kenzo Jungle L'Elephant (to differentiate it from Jungle Le Tigre) is warm and spicy, with a dose of weirdness (always a plus), a rich gourmand oriental anchored by tropical flowers and laden with vanilla. (The official list: mandarin, cardamom, caraway, clove, heliotrope, ylang-ylang, mango, licorice, vanilla, patchouli, cashmeran. Make of that what you will.) But as it develops you discover it's more than just weird: there's something horrifying about it. It's too spicy, too sweet, assaultively so, and it just goes on and on. It's the Attack of the Killer Dessert, a thick, clumsy pot of heavily spiced pudding made by someone who has lost their sense of taste. A lot of people love this: every time I put it on, I just want to take it right back off again. I actually really like this one - but I am known to like weird a lot - good to hear other people's take on this. And I agree that the bottle is terrific!! In fact, I recommended it to a friend who wanted a new perfume with a little clove, and she bought a bottle unsniffed and loves it. This gets a lot more yeses than noes: most people who try it seem to adore it. (Ordering a sample is a great idea.) And there isn't one thing about the idea behind it that I don't like, and the list of contents and the description of it both put it firmly in the category of things that I love. But it just doesn't work on me! At all! It is one of the enduring mysteries of perfumery. it sure is one of the enduring mysteries - how the same or similar notes in one beloved fragrance doesn't make it's magic known in another fragrance. And so fun to sleuth it out! Have you ever smelled ETRO Raving? I think they smell almost exactly alike!